Whether it’s your annual eye exam or your first exam in years, it’s very important to check your eye health as they can be early indicators of other potentially more serious health conditions. A comprehensive exam takes about forty-five minutes and includes: a refraction, dilation and an eye health check. An office visit is a non-routine exam that quickly checks for any area of concern you may have about your eyes. Depending on your symptoms the length and depth of the exam will vary. The cost of an office visit will vary depending on procedures performed. We carry a wide range of contacts to ensure a comfortable fit. Schedule your appointment for new contacts or to check your existing lenses are the best fit for you. We have a variety of 1-Day disposables, 2 week disposables, and monthly’s. In addition, we can special order rigid gas permeable (hard contacts) for medically necessary needs or other conditions. Interested to place an order for your contacts? We can have them shipped to you in as short as two days to the comfort of your home or office. Or you can pick-up in our office at your convenience. Ask us about the rebate program. Don’t worry about the hassle of all the forms, we’ll fill them out for you! If you feel like your glasses aren't fitting properly any longer, come on in to the office to get them adjusted free of charge.  *In some cases items not purchased with Poplar Spectacles may not be adjustable as we are not held accountable for any breakages.